"Busking" is "turning a stranger into a paying customer in just a few seconds"
OLD TOWN ALEXANDRIA, Virginia (CNN) -- As you walk down Prince Street in Old Town Alexandria, Virginia, it may be easy to forget that it's 2009. Music preservationist Curtis Blues works the streets of Old Town Alexandria, Virginia. You might find a wooden-wheeled carriage rolling by, drawn by a mule. Holding the reins and telling the history of the town is a woman dressed in clothing of an era long past. Gas lanterns burn and adorn intricate woodwork on townhouse entrances. Cobblestone streets preserving the past lead the way to the waterfront, where the old Torpedo Factory lies. And if you listen carefully, you can hear the sounds of the past echoing in the alleys and old tunnels. The sounds come courtesy of musician Curtis Blues. "This is a one-string diddley bow," Blues says as he picks up a crude, homemade instrument constructed from items you might find in any kitchen. "They used to tie a wire on a barn door and amplify it with a metal jar top." He picks up the portable version of the diddley bow and plucks the one string. He uses a metal slide to change the pitch and creates a rather unique musical sound. Although Blues hadn't yet begun performing, a crowd of curious tourists gathers to watch. Blues is a Mississippi Delta Blues preservationist. He owns a plethora of instruments that were used by delta musicians starting around the turn of the 20th century. He picks up his harmonica and begins to play. Powerful bending notes fly from it as he demonstrates how his heroes used the shape of their mouths to create a louder, richer sound that would reach more people on the streets. Blues started playing blues harmonica when he was 14 years old, and he has been studying, learning and performing blues music ever since. "This acoustic style of music, I grew up with on the folk circuit. So I was exposed to some of the old blues men, and I fell in love with it," Blues says. "My mission is to preserve it as the acoustic form it was before it went to Chicago and became electric band music." For the past 14 years, Blues has had a one-man-band blues show that he performs in the shadow of the Old Torpedo Factory, located on the boardwalk in the heart of Old Town. 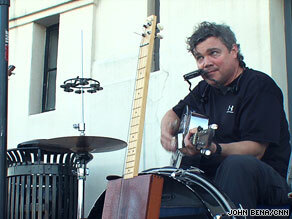 His show finds him with a bright silver metal resonator guitar, a harmonica mounted around his neck, and a bass drum with cymbals. "They performed in settings just like this on the side of the river," Blues says of the old-time blues musicians. "So when I'm playing out here I'm really stepping into their shoes. But there's no assumption that anyone has to pay me at all. The term in Europe is called 'busking.' The idea behind busking is that you're turning a stranger into a paying customer in just a few seconds." One of Blues' "busking" techniques is to get the kids involved. "Would you like to be part of my band?" he asks a shy little red-haired girl hiding behind her mother's leg. "I could use a pretty girl like you in my band! Come on up here and grab a maraca." Blues soon has a small percussion section to his right, and each child has a parent holding a dollar for the children to place into his tip box after the song in appreciation of the fun that has been added to their day. Near the end of the song, Blues lowers the music and addresses the crowd. "Now if you're thinking of tipping me today and I hope you are, please consider my huge family!" And he gestures to the several children next to him holding colorful plastic maracas. "And that little one there," he goes on, "he eats the most out of all of them." The crowd laughs, and dollars pile into his tip box. Later in his show, Blues picks up a cigar-box banjo. It is literally a wooden cigar box that is attached to a long wooden neck with four strings fastened at either end. He describes the instrument to a few very interested onlookers. He stands up and sings a classic blues song called "Turkey-Legged Woman" and begins to engage the crowd face to face. "Part of my job out here is not only to perform the art, but to educate the public to support the art," Blues explains. "This idea of live music, that when they bring their kids by and they come across a person performing outdoors without a microphone, that this is something of value that we should treasure, and that we should support." "The future of the blues is very bright," says Blues, "because the human spirit always resonates and relates to the blues." The sun begins to set. The crowd slowly changes from shorts and flip-flops to skirts and heels. Blues says he will play on the street "as long as there are people here to stop and listen." Then he runs his slide up the neck of his steel guitar.